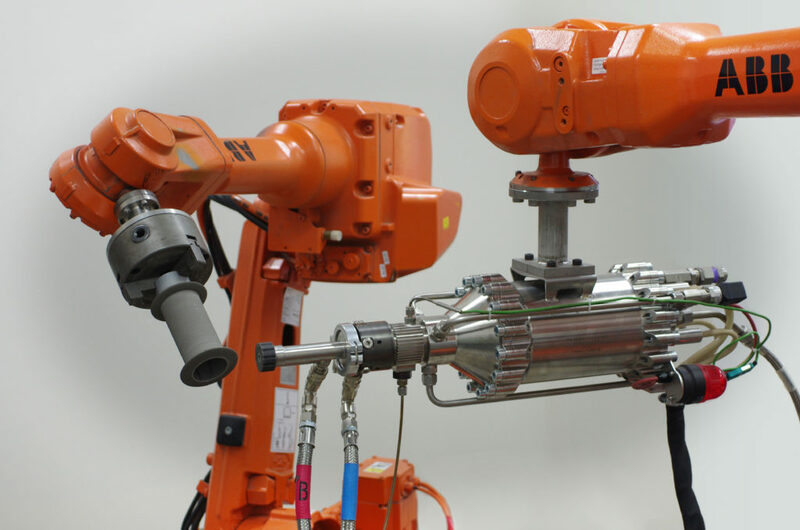 We’re using robots to deposit powdered metal onto surfaces faster than the speed of sound. As we farewell the final winter chills (you may still be fighting off a nasty virus – get well soon!) it’s important not to hate on the concept of ‘cold’, and remember that the world has given us many wonderful things prefixed with this word. Cold Play, Cold Chisel, cold cuts… and now we’re going to introduce you to another: Cold spray. We told you cold spray was cooler than a nasal spray! But why do we need such a sophisticated spray can? Well, this technology that builds up layers of metal, ceramic, polymer or composite materials in a uniform thickness, can be applied to a range of industries from biomedical to aerospace. For example, we’ve used it to create super-thin coatings for electronics and to repair worn engine parts. And because there is no melting involved, the particles keep their initial chemical properties, making cold spray the perfect process for applying thermally sensitive materials, or those materials that change when they are exposed to heat. Using cold spray eliminates several steps in traditional manufacturing because the process goes directly from powder to finished product. Even materials that are chemically dissimilar can be joined using cold spray. And best of all it is efficient, cost-effective and environmentally-friendly. One of our partners, and an early adopter of cold spray, Laserlife Littlejohn, has been using the technology to improve their manufacturing business. They supply high quality rollers to the printing industry. We’ve been working with them since 2010 to develop a patented method for manufacturing titanium rollers, and by using cold spray in their fabrication process they’ve increased deposit efficiency from 50% to 98% and increased deposit speed by four times – that’s faster and better! Aside from using cold spray for coating we worked with our partners at Titomic to develop a patented method that applies titanium or titanium alloy particles onto a scaffold to produce a load-bearing structure. In this case to create a titanium bike frame. Titomic is building this technology into a metal 3D printing process that they are calling Titomic Kinetic Fusion to manufacture complex parts without shape and size constraints. This is completely changing the way we think about 3D printing and opening up new doors for Australian manufacturers to create highly-specialised products. You can see in this animation how Computational Fluid Dynamics, or CFD, modelling adds a further dimension to the cold spray process. For the first time our researchers can see what’s happening inside the cold spray gun while in use, at each step of the way. This computer modelling makes it much easier to optimise every spray and even provides a platform for new discoveries to be made. Warming up to the idea of using cold spray? Cool! Some inkling of the binding process would be illuminating… in my monkey world powders don’t stick together, i.e. they are powders! Is it the impact? Doesn’t that generate heat?